when I open libusb-win32 - libusb-win32 devices - 10/31/2016 12:00:00 AM - 1.0.1.0 and I want instal KarmaGripDevant.inf open this file like notepad. What I'm doing wrong. please help me. thanks erikv1127. 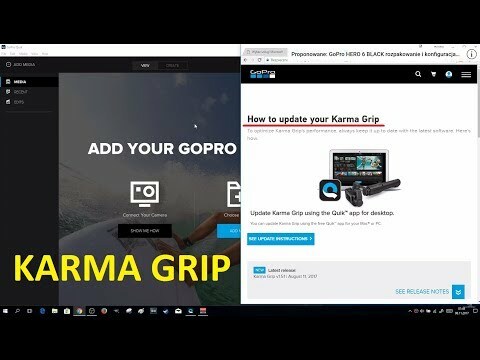 now I have karma grip v.1.51 and gopro 5 v.2.51. Quik both recognize. and now when I start the karma grip, it is placed in the recording position but the camera does not light up. I perform a hard reset. camera and karma grip are placed in the recording position, but the karma grip button does not trigger recording for shooting. I'm a bit disappointed, but I still hope that a solution is found. please GO PRO experts do something I would like to record and do not digest 1001 solutions. now I took the sd card from the camera and mounted the camera back to the karma grip. I turn on and put in the recording position, press the shooting button and the camera tells me that it does not have a sd card. I re-insert the sd card into the camera and make the sd card format and put it in karma grip. and go pro **bleep** finally works. :-) Sorry gopro guys. now that the camera works I find it slightly loud around the axis. Your solution works perfect for me. If it can helps other peoples facing the same issue, I download libusb-win32 - libusb-win32 devices - 10/31/2016 12:00:00 AM - 1.0.1.0 from the website http://www.catalog.update.microsoft.com/Search.aspx?q=gopro. Once dowloaded, I extract the files in a folder, right click on the file KarmaGripDev.inf and select Install. You get then a popup saying that installtion is successful. Then I plug the karmagrip withthe hero5 to the computer, and quik recognize the Karma Grip finally, and offer the upgrade ! The windows app I was using would not extract the files so that they could be installed, downloaded winzip universal and used it to open the file, was then able to install the file, now everything works.